The threat of a major Tiger guerrilla attack to mark the fourth anniversary of "Eelam War Three", both in and outside the battle areas, placed troops on a high level of alert throughout this week. Though no major incidents occurred, perhaps due to the greater level of preparedness, there were several probing strikes in the Jaffna sector. Main among them was an attempt by a flotilla of ten Sea Tiger boats to attack the Sri Lanka Navy detachment at Kilaly just before midnight last Monday. The attempt was made whilst 122 mm artillery barrages, fired from two guns, rained on the detachment from the direction of Pooneryn. It continued for nearly two hours and over 100 rounds had been fired in what was clearly a liberal use of artillery shells. This came as confirmation that fresh stocks had been acquired. Troops directed counter artillery barrages from 54 Division headquarters at Elephant Pass whilst Navy personnel engaged them from the shore and from boats. When the fighting ended around 1 a.m. after the Sea Tigers withdrew, one soldier had died and a sailor was wounded. 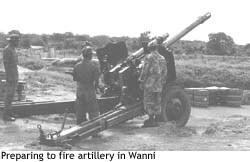 Mortar attacks on Elephant Pass defences, described as routine nuisance, continued throughout the week. That also reflected an increase in the frequency of rounds fired. These fresh attacks coupled together with threats of a major guerrilla strike had led to counter measures. Troops operating ahead of defences in Paranthan ambushed a guerrilla group last Thursday killing four. In another incident at Thadduvankody, north of Paranthan (and west of the Chundikulam Sanctuary), troops attacked an LTTE bunker with machine guns and rocket propelled grenades killing five. Reports of increasing threats in the Jaffna peninsula grew this week after reports that large stocks of explosives had been smuggled in by boats. Military officials say these are for use in mines, improvised explosive devices and for blasting targets. They fear this may be part of efforts to unleash a new wave of violence in the peninsula. Last Wednesday, the Ministry of Defence said, troops discovered two kilogrammes of explosives at Uduvil. Other items found in a house had included eight rocket propelled grenades (RPGs), explosive cans and anti-personnel mines. But a more serious development came at Uyilankulam (near Thallady, on the Vavuniya-Mannar Road), the gateway to uncontrolled areas. Movement of all supplies, including food, medicine and travel by civilians including Non-Government Organisations have come to a halt for the past nine days. On April 16, a Police Inspector and two Constables manning the check-point were killed by Tiger guerrillas. Lorries carrying supplies to uncontrolled areas unload their cargo in a designated zone at Uyilankulam. These are later loaded into lorries arriving from the uncontrolled areas. That day, the three policemen had walked ahead of their checkpoint to ascertain why lorries had not arrived. Tiger cadres seized them and shot them dead. Their bodies were later handed over to the ICRC (International Committee of the Red Cross). The Ministry of Defence accused the LTTE of going back on "their word" by not agreeing to open the Poovarasankulam- Moonru murippu - Thunnukai road, a closer route to uncontrolled areas. Hence, it said the Uyilankulam route had to be opened "inspite of many constraints." There has been no formal response so far from the LTTE to the MOD charge. A prolonged closure of the checkpoint will not only lead to food and medical supply shortages but also leave the uncontrolled areas completely cut off. In a bid to resolve the issue, Government Agent, Vavuniya, K. Ganesh, has already held talks with representatives of the ICRC. The idea is to persuade the ICRC to resume the escorting of lorries carrying supplies. Military officials say ICRC officials earlier provided escorts to lorries. However, at the time of the incident, there had been no escorts. Security Forces Commander, Wanni, Major General Lionel Balagalle, is to chair a conference on this matter next week. Colombo's intelligence community is puzzled over why the LTTE had not resorted to taking on major targets in the past few weeks. Fears of such a possibility were heightened following intelligence reports in the wake of the fourth anniversary of Eelam War Three on April 19. Military Intelligence officials wanted to question Gnanaprahasan Anthony Thavachelvam alias Anthony Master, now in custody with the Terrorism Investigation Department (TID) to ascertain whether he could offer any answers. But TID detectives were going through their own investigation and they would have to, like officials of the Directorate of Internal Intelligence (DII), await their turn. Anthony Master, described as a senior LTTE intelligence cadre had been handpicked by Tiger intelligence leader, Pottu Amman, for an assignment in Colombo. (Situation Report April 11). It has now transpired that Anthony Master maintained direct links with Pottu Amman whilst operating in Colombo. He had telephoned an LTTE cadre living in London almost every week. His identity is known. The man in London had in turn kept in touch with Pottu Amman somewhere in the Wanni jungles through a satellite phone. Through that link, Anthony Master had sent messages to Pottu Amman and received instructions. Some military intelligence officials say the "high level of preparedness" to meet any LTTE threat may be one of the main reasons for the absence of major attacks. However, officials of their counterpart agency, DII felt one of the reasons to be a shift in emphasis from the battlefield to the political arena. They say the LTTE had already launched an international propaganda campaign to coincide with the ongoing NATO bombing of Yugoslavia. As reported in these columns last week, the Federation of Tamil Associations of the United Kingdom, is holding a "conference and rally" by "Tamils living in Britain" today at Alexandra Palace in Wood Green. The LTTE backed meeting is to "express support for an independent Tamil Eelam." Today's meeting is intended to draw international attention to what the LTTE perceives are similarities between Kosovo and its own struggle. Threats from the LTTE in the past weeks and its new international political campaign came up for close scrutiny at a recent meeting of the National Security Council presided over by President Chandrika Bandaranaike Kumaratunga. The move has led to a high ranking officer of the Directorate of Internal Intelligence undertaking an European tour though one cannot elaborate on the details of his mission. The London meeting of the Federation of Tamil Associations of United Kingdom takes place at a time when the post of Intelligence Officer at the Sri Lanka High Commission in London remains vacant. The last to hold this post was Major General Chula Seneviratne. He has now assumed duties as General Officer Commanding (GOC) the Army's 311 Division which covers the country's east. Last week, Defence Secretary, Chandrananda de Silva, interviewed two Colonels and a Lieutenant Colonel from the Sri Lanka Army for posting to London. All three are experienced intelligence officials. The DII whose nominees have held this post before Maj. Gen. Seneviratne is also strongly staking its claim to send one of its senior officers to London. A decision is to be made later next week by the Ministry of Defence on who the rightful candidate should be. It's not only the military and the battlefront that preoccupied President Kumarartunga early this week. She also presided over at a crisis meeting to provide relief to those affected by the recent floods. A notable invitee at such a meeting last Tuesday was General Rohan de S. Daluwatte, Chairman of the Joint Operations Bureau (JOB). He was to oversee the deployment of troops to assist in flood relief activity. There are strong indi cations that the four month old JOB will soon become a fully fledged Joint Operations Command (JOC) and its Chairman re-designated General Officer Commanding (GOC). The move will mean that General Daluwatte who now functions in a civilian capacity will be recalled to the GOCs post from the Reserve List. This will enable him to wear military uniform. Authoritative sources said yesterday that the upcoming change will be effected through a Gazette notification. That will mean the proposed JOC will have legal teeth with command and control authority. Same sources say that the mandate given to the JOB will be re-defined when the JOC is established. In what appears to be preparations for the change, JOB has become a hive of activity in the past weeks. The JOB headquarters in the Army Headquarters complex has been renovated and re-furbished at a cost of nearly ten million rupees. It is fully air conditioned and has subdued piped music round the clock. Last week, JOB officials initiated procedures to procure sophisticated communications equipment, computers and other requirements amounting to over ten million rupees. JOB Chairman, Gen. Daluwatte, has also been found an official residence, one of the bungalows coming under the charge of the Sri Lanka Navy. This will now enable Army Commander, Lt. Gen. Srilal Weerasooriya, to move to General's House, his official residence. When it was established on January 6, 1999, the Bureau consisted of the Chairman, the three Service Commanders and the Inspector General of Police. The Directors of Operations of the three services and their parallels in the Police will function as associate members of the JOB. It is staffed by officers from all three services and the police. A Ministry of Defence statement on the JOB declared "The Chairman will work through the respective service commanders for the implementation of all matters pertaining to operations. The respective service commanders will be responsible to achieve the objectives/tasks spelt out by JOB. "The Joint Operations Bureau will be responsible for the following: Prepare strategic plans in consultation with the three Service Commanders and present them to the National Security Council. Co-ordinate the planning of operations based on the directions given by the NSC. Co-ordinate and control the development of resources. Monitor the progress of all operations. Co-ordinate civil administration where necessary after restoring civil administration." Despite the above mandate, the JOB was not fully operational during its four months of existence. During that period, Gen. Daluwatte, undertook a tour of the United Kingdom, France and United States to study the working of joint military command mechanisms in those countries. Upon his return, he handed over a report to President Kumaratunga, stressing the need to strengthen the joint military apparatus in Sri Lanka to ensure maximum use of resources and minimise expenditure. He also listed a series of other recommendations. The Sunday Times learns that a new mandate to the proposed Joint Operations Command (JOC) will incorporate some of the recommendations in Gen. Daluwatte's report. Since "Operation Jaya Sikurui" (Victory Assured) was called off, President Kumaratunga has personally overseen the conduct of military operations. Senior officials responsible have made presentations prior to obtaining her endorsement and Army Commander, Lt. Gen. Srilal Weerasooriya, has kept her regularly briefed. Deputy Defence Minister, Anuruddha Ratwatte, has thereafter visited operational areas in the company of the three service commanders and the IGP to ensure the execution of the military operations and to confer periodically with senior field commanders. Conspicuous by his absence during these tours was JOB Chairman Gen. Daluwatte. It is widely known that Minister Ratwatte who personally ran the military machine against Tiger guerrillas until the aborted "Operation Jaya Sikurui" was opposed to the setting up of the JOB. In security conferences he regularly chaired in Colombo, sometimes even at the JOB headquarters, Gen. Daluwatte or other JOB officials were conspicuous by their absence. It is immediately not clear what Minister Ratwatte's response to a proposed Joint Operations Command would be. He is said to be currently on a tour of Italy and Croatia. During the past few months, operational activities by both the security forces and the LTTE have been low profiled except for the three operations to expand military real estate in the Wanni to the West and East of the A-9 axis. Even these three operations were, in the tactical sense, more meaningful for the lack of opposition to it by the LTTE than the military significance of it. This begs the question as to why the tempo of the conflict has tapered off militarily. The first conclusion is that both the security forces and the Tiger guerrillas are consolidating their positions. However, it is not logical that the enemy is given respite to re-organise and consolidate. It is a cardinal tenet of guerrilla warfare that the enemy is harassed relentlessly. In that context, the low profile strategy of the Tiger guerrillas is perplexing. Especially so when it is no secret that the security forces have to secure and re-organise its defences in the expanded Wanni if it is to be of any tactical advantage to the MSR (main supply route) strategy of linking the Jaffna peninsula to Vavuniya. Similarly, any political advantage to the Government too requires that these areas be administratively consolidated. It obviously, therefore, will be advantageous to the LTTE to thwart Government efforts by all means available. The subdued strategy of the Tiger guerrillas gives rise to speculation that in the prevailing political situation, both national and international, that political consolidation should take priority over a more dynamic military offensive. The international fortunes of the LTTE are no longer at an all time high. Whilst the favoured position the LTTE hitherto had is being weakened, the international political scene is at the same time going through many changes and challenges. The ongoing crisis in Kosovo and its association with ethnic cleansing, refugees and dictatorial politics preoccupy the Western nations. The political instability in India also becomes relevant. It is a period of political uncertainties and the LTTE, which has always exploited any opportunity in international and regional politics, are planning their response to the changing situations. As perplexing as, the current LTTE strategy is, so are the apparent contradictions in defence planning by the Government as it concerns the Joint Operations Bureau. The disharmony that has so far prevailed in joint military planning between JOB and the political conduct of operations clearly indicates a division in the exercise of military command and control. This is not conducive to the effective planning and execution of the war. The division in military planning appears symptomatic of the lack of political harmony in the planning of matters of national importance. This reflects self seeking parochial interests as opposed to what should be commitments to the wider national priorities. This is only to the benefit of chosen individuals, not the benefit of the country and its people. Though late, the move to convert the JOB into JOC in that backdrop, is a significant move.